Signature HEET collection pieces are fabulously fresh and fashionably functional, they are the must-have for most of us. 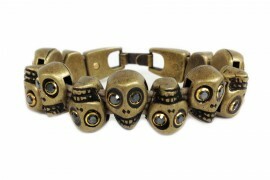 And these silver skulls will have you smiling, no bones about it. 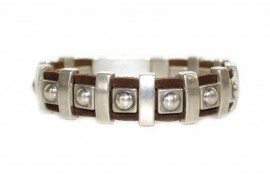 Trademarked HEET Lock Clasp 100% Nickel-Free Metal Alloy All Natural&n..
ID Crystal Antique Gold Bracelets are made with dazzling Swarovski® crystals and pearls, interspersed with complementary metal components on a premium leather strap. These classic and versatile lovlies are part of our core collection and can be worn alone, stacked and layered together or&n..
ID Antique Gold Crystal Bracelets are made with dazzling Swarovski® crystals flanked by subtle metal spikes and beads on a premium leather strap. These classic and versatile lovlies are part of our core collection and can be worn alone, stacked and layered together or mixed and matched with our..
ID Molten Crystal Bracelets are made with dazzling Swarovski® crystals flanked by subtle metal spikes and beads on a premium leather strap. These classic and versatile lovlies are part of our core collection and can be worn alone, stacked and layered together or mixed and matched with our Rock .. Simple yet stunning and built to last, definitively HEET the Inferno Pendant is a best-selling favorite. 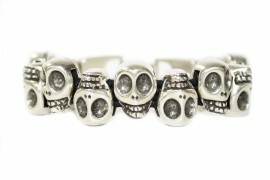 Available with Swarovski Crystal, Swarovski Hematite or Swarovski Ceramics. 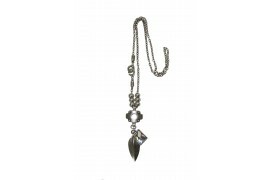 Trademarked HEET Handcuff-Style Clasp Solid Chain with Moveable Beads, Hanging Drop and Leaf Made with ..